In this undated image taken by a remote camera and provided by the U.S. Fish and Wildlife Service, a polar bear and her young cub stand next to a causeway bridge leading to an artificial island oil production platform in the Beaufort Sea in Alaska. Hilcorp Alaska oil field workers in December spotted the den alongside the bridge and restricted activity to make sure the female was not disturbed. The mother and her cub emerged March 18, stayed near the den for two weeks and headed out to see to hunt for seals. A pregnant polar bear seeking to dig her maternity den chose an unlikely spot: a snow drift along a bridge leading to an artificial production island off the north coast of Alaska. As a threatened species, polar bears are entitled to peaceful pregnancies and the operating oil company, Hilcorp Alaska LLC, took vigorous measures to make sure that happened. In consultation with federal wildlife authorities, Hilcorp restricted traffic on the causeway, monitored the den and kept things mostly quiet until mother and cub emerged three months later. "The bear, wherever she decided to den, she's the emphasis," said Christopher Putnam, a U.S. Fish and Wildlife Service supervisory biologist. Polar bears are listed as "threatened" under the Endangered Species Act because climate warming is melting their primary habitat, sea ice. Short of action that effectively addresses Arctic warming, it is unlikely that polar bears will be recovered, according to the Fish and Wildlife Service. 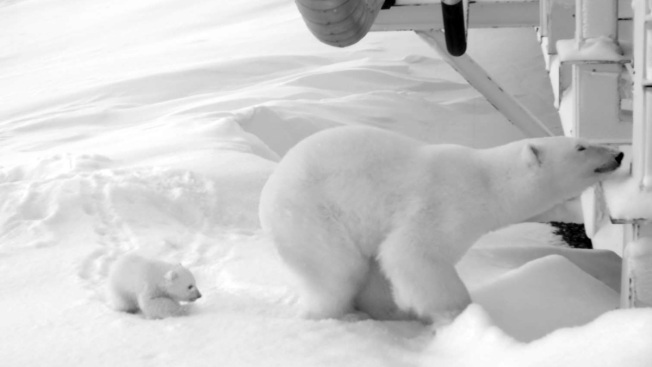 Polar bears don't hibernate, but pregnant females create maternity dens to shelter newborn cubs. If a nursing mother is disturbed, she can abandon a cub. Upward of 50 percent of cubs don't survive their first year. Oil companies working near known denning areas scout for bears using airplanes equipped with infrared cameras that detect bears in dens. "Typically they pick locations that are away from oil field infrastructure," said Beth Sharp, Hilcorp's habitat and wildlife specialist, who has worked on Alaska's North Slope for nearly two decades. A Hilcorp security officer in December spotted a hole in a snow drift along the 1.5 mile- (2.4 kilometer) causeway leading to Endicott Island, a production island about the size of 34 football fields. The hole looked like a den entrance, but Sharp was skeptical. Workers borrowed an infrared camera from the company fire department to take a photo inside the snow drift. "There was a bear-shaped lightbulb as clear as could be," Sharp said. Hilcorp and the Fish and Wildlife Service worked out a plan to minimize disturbance. Workers on their way to Endicott were shuttled by bus instead of individual pickups. Hilcorp parked a heavy-duty snow-removal truck. Non-essential traffic stopped. Advocacy group Polar Bear International and Brigham Young University, which are collaborating on a long-term denning study, monitored the den with a remote camera system. Mother and cub stepped out of the den on March 18. They spent two weeks around the den, eventually marching off to sea ice to hunt for seals. U.S. Geological Survey researchers say south Beaufort Sea polar bears increasingly use land for maternity dens as sea ice conditions change. That could mean more cases of polar bears giving birth near oil field infrastructure, Putnam said. "We don't know if it's a trend, but that's why we have these plans," Putnam said.